with a popular iconography is the product of two important figures in seventeenth century Brussels weaving. J. van der Borcht I (c.1650 – 1713) was a master weaver and tapestry entrepreneur who established a most distinguished family tapestry firm and was followed by J. van der Borcht II, Jasper van der Borcht, Pieter van der Borcht and Jan Frans van der Borcht, taking the operations into the mid18th century. Their wealthy patrons allowed the firm to engage some of the best designers and as a result the artistic quality, as well as the sheer technical execution, is always high. The Van der Borchts wove tapestry series (or single pieces) of Mythological Scenes, Months, Allegories, Armorials, Triumphs of the Gods, The Continents, as well as more down-to-earth genre scenes designed or inspired by David Teniers II or Teniers III. Jan van Orley, Augustin Coppens, Gerard Lairesse, Phillipe de Hondt, and the Antwerp-born Lodowijk van Schoor (c.1650 – 1702), the designer of U-1362. Van Schoor was the successor of David Teniers III. He was the designer or co-creator of about fifteen sets of tapestries. His cartoons were utilized and copied in both the Northern and Southern Netherlands, and continued popular well into the 18th century. His style, especially in his later works, is more harmonious and refined than Teniers and he avoided genre scenes with peasants. Van Schoor sometimes collaborated with other artists, for example Lucas Aertschellinck (1620 – 1699) who specialized in landscape backgrounds as in the set of Mythological Scenes” woven c, 1700 in the Van der Borcht shop. He did not collaborate on this tapestry, Van Schoor’s figures are graceful and his color schemes vivid, in keeping with the best of contemporary Flemish tapestry. 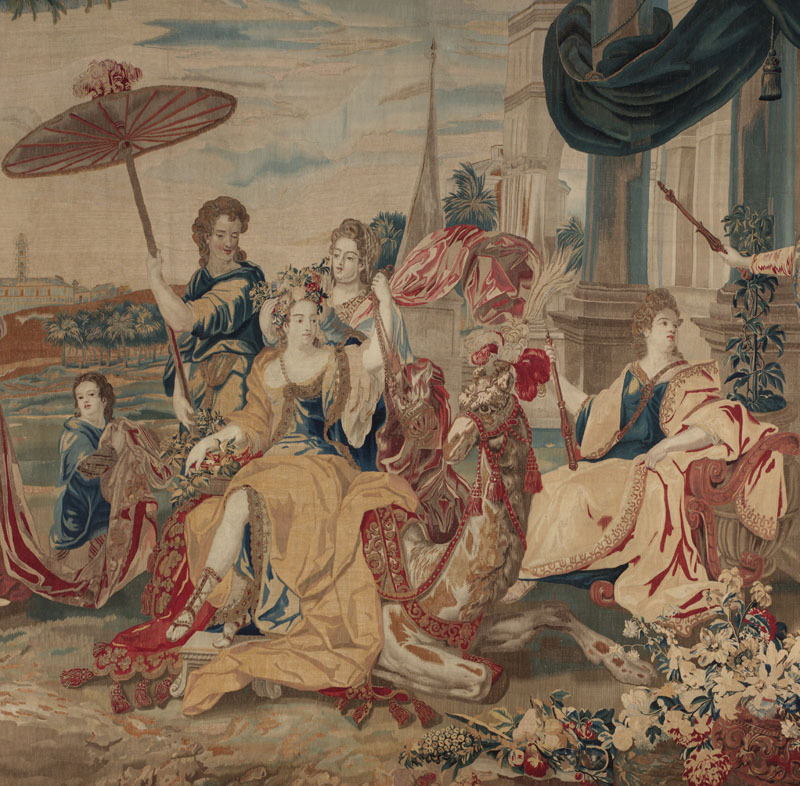 Van Schoor’s designs influenced artists working at great remove from Brussels, even so far as the Florentine workshop of Bernini and Demignot where a Van Schoor inspired “Four Continents” set was woven in the early 1720’s. 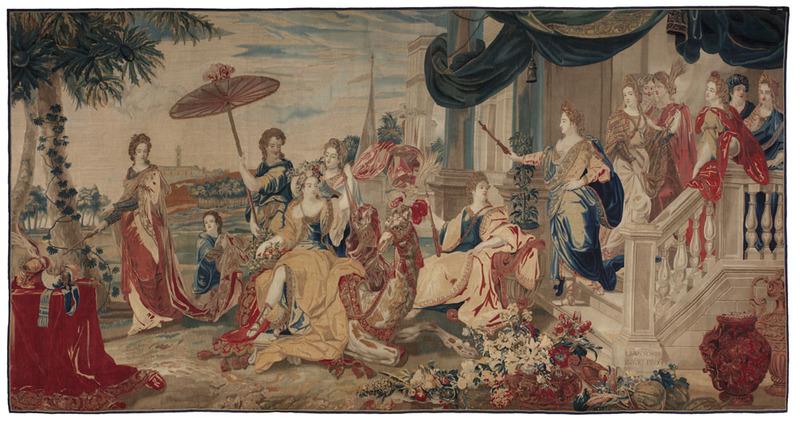 The “Four Continents” or “Four Parts of the World” was a popular theme in the 17th and 18th centuries for tapestry patrons. Each continent was identified by native peoples and animals: America (North and South together) by Indians and the Turkey bird; Asia by Turks and camels; Europe by figures in classical or western garb and eagles or horses. Of course, the iconography varied and the scenes were adapted to suit the clientele. 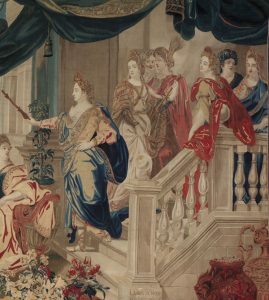 Our tapestry shows women almost exclusively, some languorously seated, others arriving from the right down a classically balustraded low staircase from a luxuriously draped stone building. The only animal present is a camel with elaborate trappings. A parasol is held over the head of the princess seated on the recumbent camel. There is virtually nothing else exotic about the scene. The women are all attired in loose, opulent garments. There are two male Turquerie figures almost hidden on the extreme right. The figure on the stairs gesturing with a baton is gender ambiguous: either female or a male in the Louis XIV style. The attire and footwear are not definitive. Van Schoor designed other versions of the “Asia” tapestry. An example woven in the Pieter van der Borcht workshop in the mid-18th century, shows a crowded scene of the Pilgrimage to Mecca: a camel bearing the ceremonial Mehmal, a pair of exotic female dancers in the foreground, and a veritable scrum of Turkish genre figures and horses filling the picture area with a vaguely Turkish urban background.The almost wholly feminine cast of our “Asia” tapestry is not by chance. By the later 17th century and in increasing numbers in the 18th, European women were travelling to the Near East, especially to Constantinople and the Levant, and enjoying first hand and for the first time previously untouched lands and cultures. When back in Europe, they were interested in preserving the experience. Far fewer travelled to sub-Saharan Africa, the wilds of inner North and South America, or the far East. Hither Asia was more accessible, colorful and foreign. When ladies gathered, a tapestry of the exotic East was always a topic of appreciation and conversation. Lady Mary Wortley Montagu was not the only European woman to travel in the Orient in this period. The “Four Continents” theme was also woven in Brussels by Jean Francois van den Hecht in the Albert Auwerx shop. Auwerx ran a smaller, less prosperous business than the Van der Borchts and he often utilized cartoons originally intended for others in his weavings. The original well decorated main border and the plain outer band bearing the Brussels town mark and the signature or mark of the weaver are lacking here. Although Auwerx – Van den Hecke is a possibility, it is more likely that our fine example is by the Van der Borcht workshop and was executed during the lifetime of Lodowijk van Schoor. It is well preserved, with lively colors and an extremely elegant mise en scene.